To be effective, the performance management process must be firmly linked to and rooted in the organization’s core strategy and business goals. Strategy involves the formulation of the organization’s mission, goals, objectives and action plans for achievement. Every employee must share in this. The key is to clearly articulate each employee’s goals, objectives and competency requirements in a way that will facilitate the successful achievement of the organization’s strategy. In performance management, strategic and business goals should be cascaded throughout the organization. Employees should be able to see a direct link between what they must achieve and the organization’s vision, strategy and goals. These should be reflected in each employee’s performance plan as well as in the competencies needed for success. To ensure that there is complete coverage of all of the important strategic elements, organizations often use performance frameworks for designing strategy. 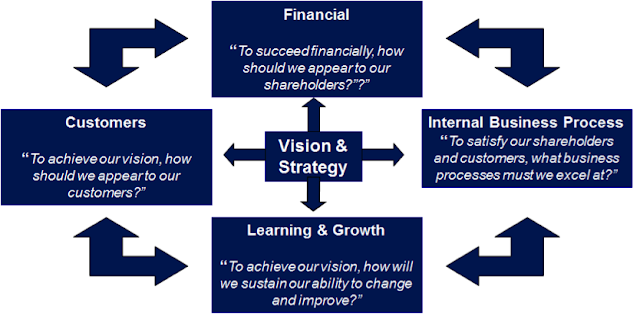 The one most commonly used is The Balanced Score Card in which Vision and Strategy for the organization is considered from 4 perspectives: Financial; Customers; Internal Business Processes; as well as, the Learning and Growth needed to achieve the vision as well as to adapt and improve. Companies will build goals into their performance management system that are aligned with each quadrant of the balanced scorecard. For example, the IT department might have business goals related to supporting customers (Customers quadrant), providing results within budget (Financial), creating software solutions to support processes (Internal Business Process) and ensuring it has the talent to create innovative software solutions (Learning and Growth). These goals for the IT department would then be cascaded down to each group and individual performance plan. The balanced scorecard is only one example of such a framework. In each case, the elements are translated in measurable indicators of success, which are reflected in management and employee performance plans. Looking more closely, competencies translate the strategic vision and goals for the organization into the actions or type of behavior employees must display for the organization to be successful. Competencies effectively form a bridge between how the employee needs to behave and the success of the organization. It is sometimes hard for employees to relate their work and performance to the organization’s overall success. For example, employees in roles like cleaners, maintenance workers, retail and sales staff, etc. often have difficulty understanding the importance of their work to the organization. Competencies help them see how their attention to quality or their concern for the customer contributes to the success of their organization. They in turn feel more valued knowing the importance of their role. This helps drive change in an organization - by reinforcing those key competencies people need to be successful in their jobs. Many organizations reinforce both goal attainment and competencies in the performance management system. For example, a company might include both Customer Service goals (from the Balanced Scorecard) and the competency Customer Service in the performance management system. The next blog in this series on Performance Management addresses key questions and considerations in designing and implementing system that integrates competencies. Sign up to our blog’s mailing list through the form on the right-hand side to receive the rest of the series in your inbox.